These maps reflect the places where people carved their memory1 onto the landscape. Crow's Mountain can be seen from any place in the Valley, except on foggy mornings. Saskatee followed the river from north to south through through Crystal River Valley, gathering willow bark and meta:chokecherries, which had no effect. The Jenson barn looked out over Scavenger Cliff, but was nonetheless a wonderful place to dance. 13,988 feet. Ephraim Horner found God here. Red Birch Pitkin lost God here. Mariah Horner prayed here—and never said if she received an answer. Sandor's bones were buried here—and they are no longer. CR&R line comes up from Denver, stops in Eagle, Carbondale, Redstone, and Glenwood. The Catterings barely expanded Old Joe’s mining shack into a cabin large enough for them—right by the Sugar Boy Mine. Miss Sing could look out over Grizzly Peak and Ken Jones could oversee the Railroad from their home. Clancy Gaylor was found on Willow Creek with twenty-nine axe wounds. No one asked why he was so far from his home. The Heollstars lived where they could see the train come in, and where Alvina could gather her herbs on the banks of Willow Creek. The Wringles pitched their tent here. The Stokes had lived near Sad Iron Peak, but moved here on the Crystal River so Martha could wash her memories away and Chirpy could play. The Harmons never really noticed which of the two houses by the Black Queen Mine belonged to which Harmon. The Harmons scattered across these houses. 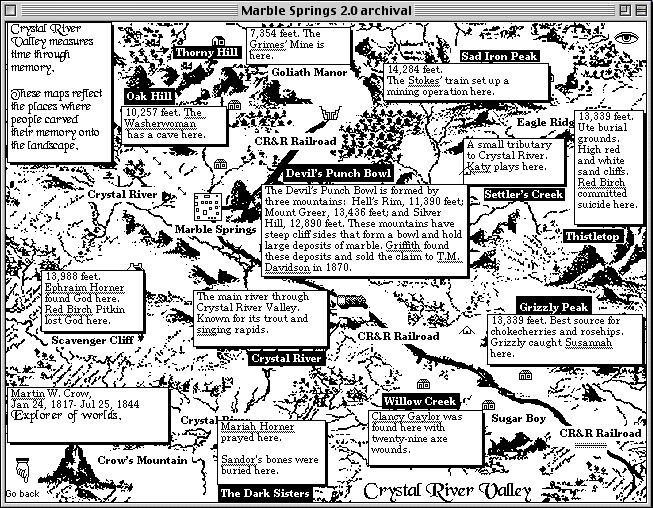 Marble Springs is not quite in the center of the map. CR&R Railroad dead ends at the quarry, as there is nothing more of interest further on. The Pitkins were not welcome to live in Marble Springs proper, so they are outside the town walls, near the Devil’s Punch Bowl. The Devil's Punch Bowl is formed by three mountains; Hell's Rim, 11,390 feet; Mount Greer, 13,436 feet; and Silver Hill, 12,890 feet. These mountains have large deposits of marble. Griffith found these deposits and sold the claim to T. M. Davidson in 1870. The quarry lies close enough to the town for workers and at the end of the line for the railroad. The Crofts lived within sight of the Goliath Manor, but they were never invited. Goliath Manor perches half way up a hill with a good view of the quarry.